Sometimes you know certain flavors go together well. Take peaches and ginger. They make a great match. There's ginger cookies served with fresh peaches, a little ginger in the whipped cream for peach shortcakes, and ginger and peach jam. It's a mix that works. But, every once a while, you come across a classic flavor combination done in a way that makes it even better than you knew it would be. 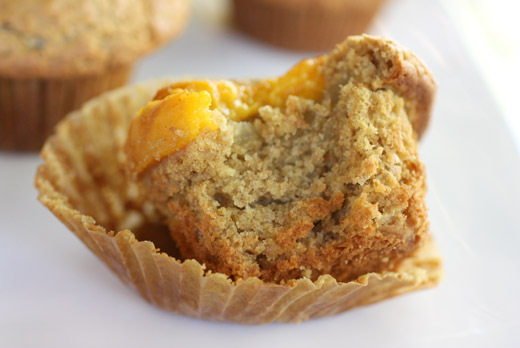 The ginger and peach flavor mix in these muffins was a wow, like I'd never tasted it before. Freshly grated ginger is mixed into the batter along with chopped crystallized ginger, and fresh ginger is also added to a melted butter and honey syrup used to coat the peach slices that sit on top of each muffin. 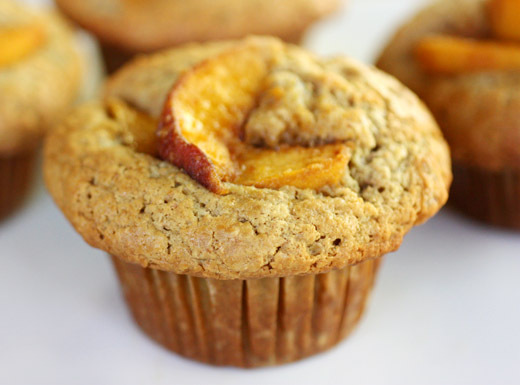 It could have been the one-two punch of fresh and crystallized ginger or maybe that peach season is winding down and I really wanted to savor these, but for simple muffins, these puppies caught me by surprise. They're from Good to the Grain which means they're also made with an interesting mix of flours in addition to the interesting flavor mix. Here, oat flour is combined with all-purpose and whole wheat flours for a very tender crumb and mild, nuttiness. You start by grating lots of fresh ginger and letting that lovely fragrance start to fill your kitchen. A little of the grated ginger was added to a skillet along with butter and honey, and the rest was left in a mixing bowl. The butter and honey in the skillet was melted, and sliced peaches were added and coated with the syrup and then the pan was set aside. The dry ingredients were sifted together, and those included oat flour, all-purpose and whole wheat flours, sugar, dark brown sugar, baking powder, baking soda, and salt. In a separate bowl, the wet ingredients were added to the remaining grated ginger including melted and cooled butter, whole milk, sour cream, an egg, and finely chopped crystallized ginger. Wet ingredients were mixed into the dry, and the batter was ready. In all the muffin recipes in this book, Kim Boyce recommends using only every other cup in a muffin pan. By leaving every other cup empty, the heat circulates well and the muffins rise better. I had learned of this trick from a different muffin recipe, and it really does work well. 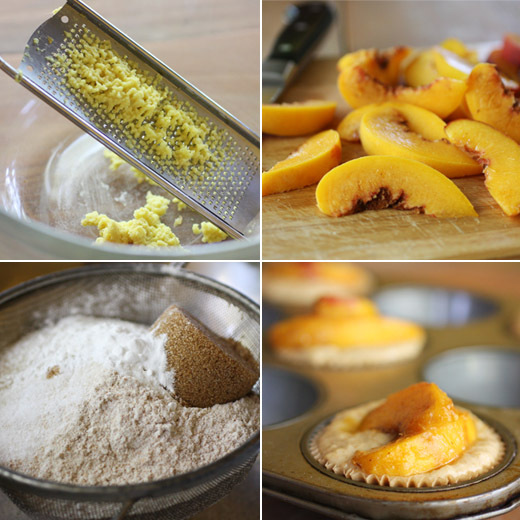 So, the batter was poured into every other muffin cup, each muffin was topped with two peach slices, and the syrup was spooned on top of the peaches before they went into the oven. Of course they smelled amazing as they baked, and of course they looked pretty with the peach slices on top. There was no doubting that these were going to be good. I just had no idea how good. I thought I knew all about peaches with ginger, but it's nice to be taken by surprise like this. I know it sometimes seems like I cook from a different book every time I prepare something, but most of my books actually get a lot of repeated use. Sometimes I grab a book for reference if I’m making something similar to one of the recipes in it and want to check quantities. And, other times, I can’t seem to stop cooking from the same book. I’ve mentioned several dishes from Power Foods , and I’ve cooked a couple of additional things that didn’t make their way into posts for no fault of their own. Today, I have one more item from that book to share. The day we hiked at Pedernales Falls State Park, I knew we wouldn’t survive on granola bars alone. I also packed a picnic lunch including sandwiches, soy-wasabi spread, and cut vegetables for dipping. It’s true that we’d worked up an appetite for that meal, but the bowl of spread I left at home in the refrigerator was just as good the next day. 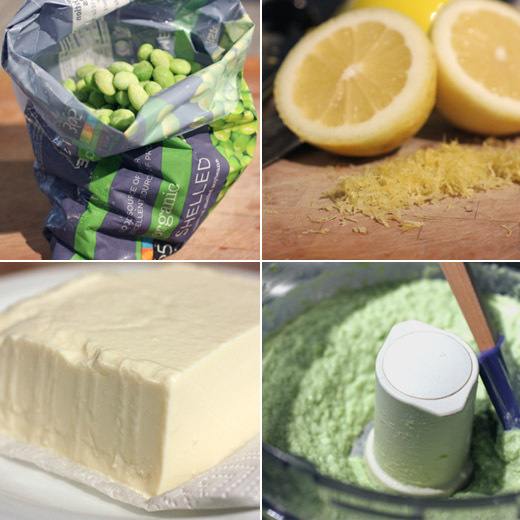 Making the spread is an easy matter started by boiling some frozen, shelled edamame and then draining it and placing it in a food processor. Also to the food processor, add some drained silken tofu, lemon zest and juice, Chinese hot mustard, wasabi paste, and salt. Taste after pureeing to decide if you’d like more wasabi or lemon, and that’s it. Garnish with black sesame seeds. 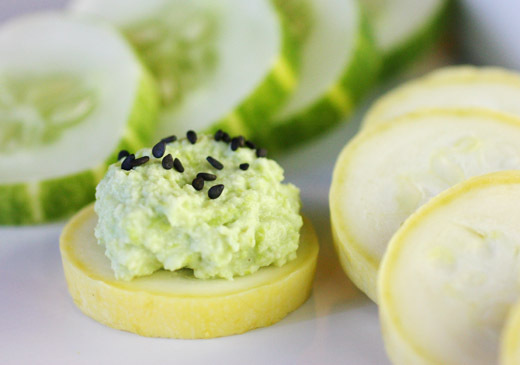 This is a light and flavorful spread brightened by lemon and given a wasabi kick. 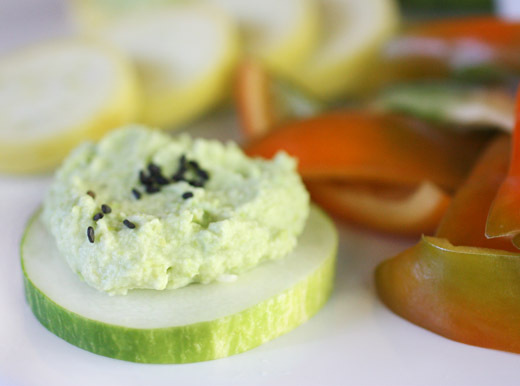 We used it as a dip for vegetables and pretzels, but I think it would be great on a sandwich or in a wrap too. I’ll probably move on to a different book next, but I’m sure I’ll pick this one up again before long. Clearly, I use hiking as an excuse to make homemade granola bars. 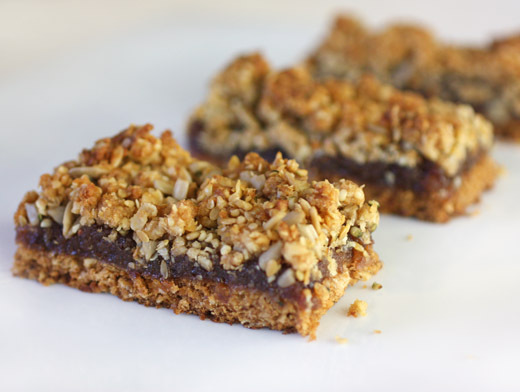 Last year, I made fruit and nut energy bars which we took with us while hiking in Arizona, and just recently I tried the granola bars from the Flour book for a state park hike closer to home. It's hot here, and it's dry, and it doesn't seem like either of those conditions will be changing any time soon. 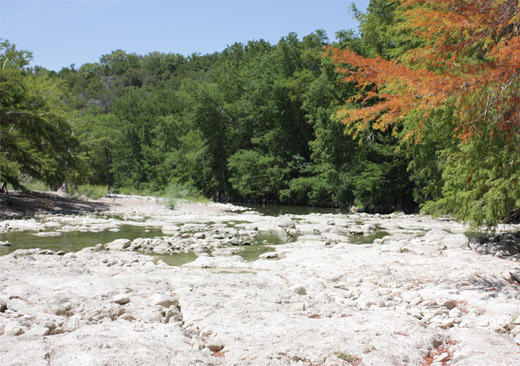 So, we ignored all of that and went to Pedernales Falls State Park for a hike, a picnic, and some splashing through very little water. As you can see in the photo below, the riverbed was nearly dry in places courtesy of our ongoing drought. It made it easy to walk up and back from one side to the other in several places along the river, but it also made for disappointing splashing after our hike. At least we had plenty of water with us for drinking and plenty of snacks. This version of granola bar is a layered affair with a quickly-made jam between a crunchy bar and a seed-filled topping. Overall, they're a little more tender than other granola bars I've tried, and they taste more like an indulgent treat than a healthy snack. About that jam, all that's involved is adding water and sugar to a mix of dried fruit, bringing it a boil, and then letting it sit for about an hour. 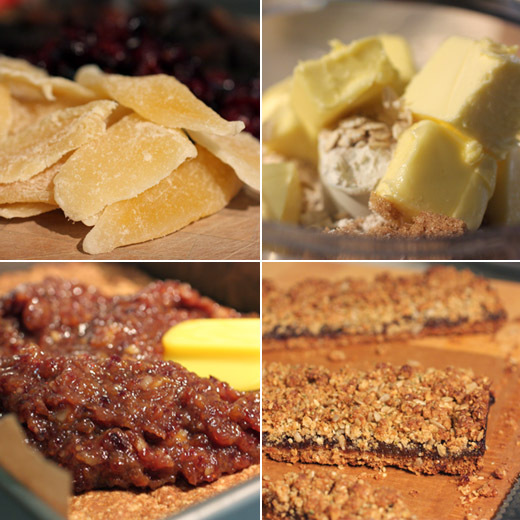 Once the dried fruit softened, the mixture was pulsed in a food processor to make a chunky jam. Dried apples, cranberries, and apricots were suggested, but I didn't find dried apples at the grocery store, so I used dried mango instead. The jam can be made in advance and stored in the refrigerator. When the food processor was cleaned and ready to go again, the base of the bars was made in it with flour, oats, brown sugar, coconut, salt, cinnamon, and butter. After being pulsed together, two-thirds of that mixture was spread in a nine inch by thirteen inch baking pan, and it was baked for about 30 minutes. For a crisper base layer, you could go for a longer baking time. The baking pan was removed from the oven, and the bottom layer was topped with the jam. The remaining granola mixture was refrigerated while the base layer baked, then, when cool, it was broken into chunks and mixed with flaxseeds, sunflower seeds, and hemp seeds. There was supposed to have been millet, and I was sure I had some millet in one of my grain and flour bins at home, but since it wasn't actually there, I used hemp seeds instead. That crumb mixture was sprinkled on top of the jam, and the pan went back into the oven for an additional 50 minutes. 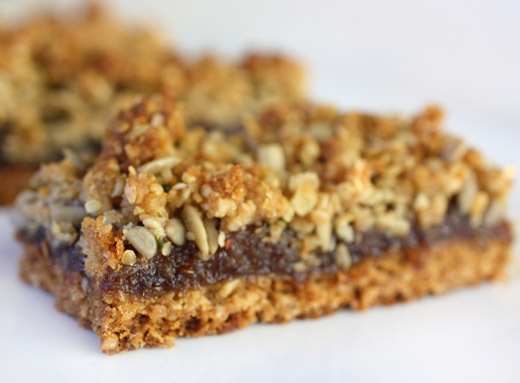 Even though these bars were full of healthy oats, seeds, and fruits, they tasted far more decadent than you would expect. The jam layer and crumb topping helped disguise the bars' granola-ness too. Our hike might have been in unrelenting heat next to a nearly dry river, but there were no complaints about the snacks that day. Lately, whatever it is that Russ Parson writes about for the LA Times is what I want to cook. There was the story about eggs for dinner and then the one about comparing vegetable dishes from Plenty and A Year in My Kitchen . Most recently, it was a story about grain salads. I know, that might not sound terribly exciting, but he went about describing ways to put vegetables and grains together and how to cook different grains for salad use, and I was hooked. It helped that I already really liked grain salads, but the three specific recipes included in the story were all great for light, summer meals. 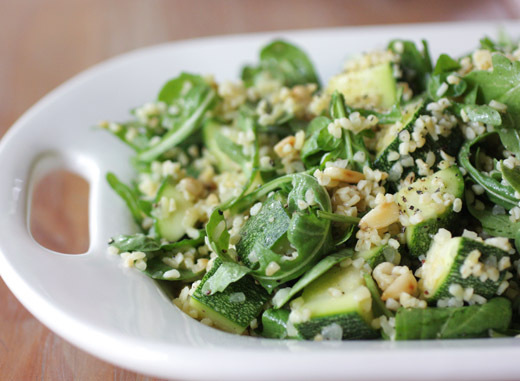 I picked the bulgur salad because it was a chance to do something new and different with zucchini. Here, that new and different thing was actually leaving the zucchini raw. It was chopped, salted, allowed to drain, and then rinsed, dried, and added to the salad. 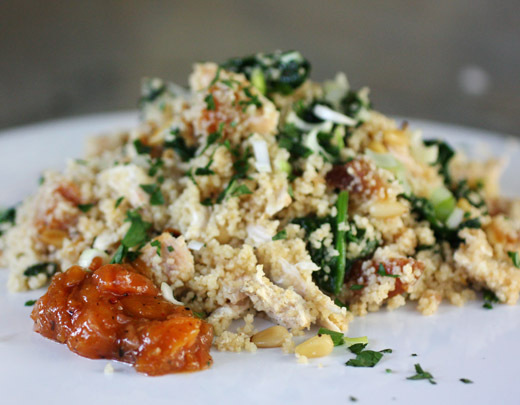 Another new and different thing in this recipe was toasting the bulgur wheat. I usually use bulgur for tabbouleh, and I always just add boiling water and let it soak. Parsons suggested toasting the bulgur in a dry pan first and then pouring water into the hot pan and leaving the bulgur to soak. The flavor difference was big, and I’ll be toasting bulgur from now on. So, toasting the bulgur only takes about five minutes and is probably easier than boiling water. The bulgur was placed in a dry saute pan over medium-high heat and was left for about five minutes. Cold water was added to the hot pan, the bulgur was stirred, and it was left to soften. It could take about an hour for the bulgur to soften, but mine was ready in about 35 minutes. Meanwhile, a couple of zucchini were chopped into big chunks and placed in a colander. The zucchini was liberally salted and left to drain. After 30 minutes, it was rinsed and dried. 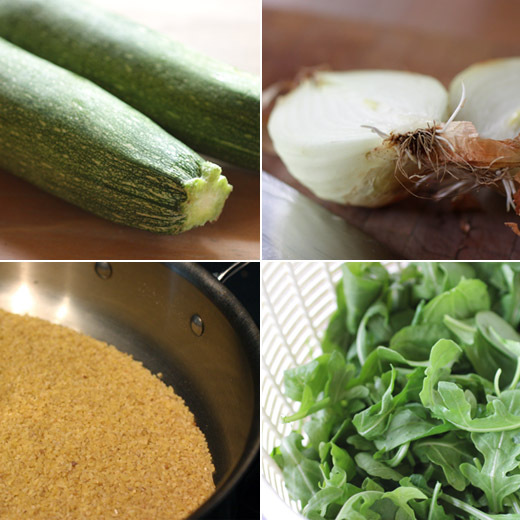 To make the salad, the bulgur was placed in a big mixing bowl with minced onion, the zucchini, lemon juice, olive oil, arugula leaves, and toasted pine nuts. Once combined, the salad was ready. 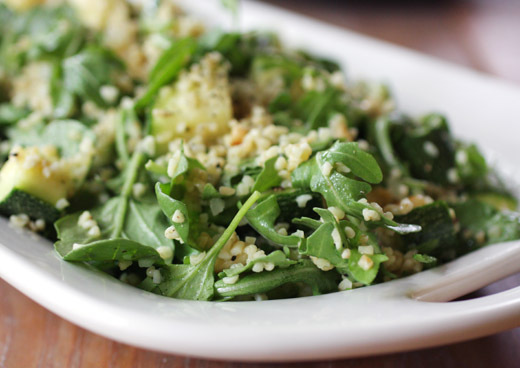 It’s a fresh and light salad, but the bulgur and pine nuts give it some heft. And, don’t think for a minute that this is just a boring, whole grain, healthy dish. The onion and lemon give it zing, the zucchini and pine nuts bring crunch, and toasting the bulgur added even nuttier flavor from the grain. The flesh of the salted and rinsed zucchini had become a little softer than when raw but it mostly retained its texture. I’m looking forward to getting creative with more toasted grain and fresh vegetable combinations or maybe whatever Russ Parsons writes about next. It doesn't get much better than having fresh, seasonal fruit paired with a really good cheese. 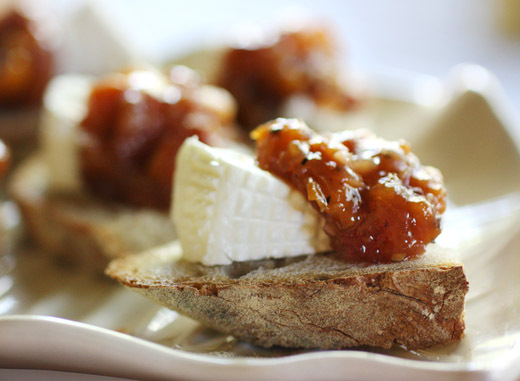 There's apples and cheddar, pears and blue cheese, peach mango chutney with a locally made chevre, and today's combination is fig relish with Toma cheese. This is another creation from Plum Gorgeous , and every time I turn the pages of that book I'm inspired by another delicious idea. Our figs arrive at the farmers' markets a little earlier in the year here than they do in other places, and I grabbed some as soon as they appeared. 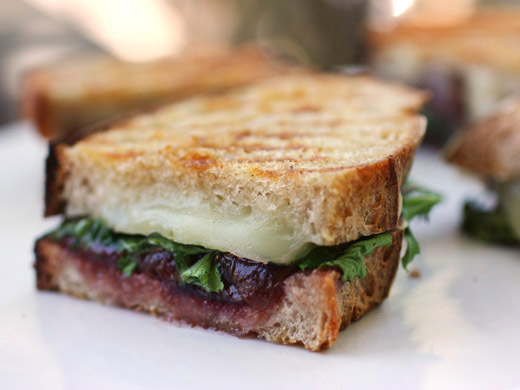 They were cooked to a consistency of jam to make the relish for these panini. Toma, an Italian, semi-hard cheese, was a great match for the relish, but brie would have been another good option. Basil leaves and arugula were layered into the sandwiches, and if you're so inclined, as Kurt certainly was, prosciutto is a fitting ingredient here as well. 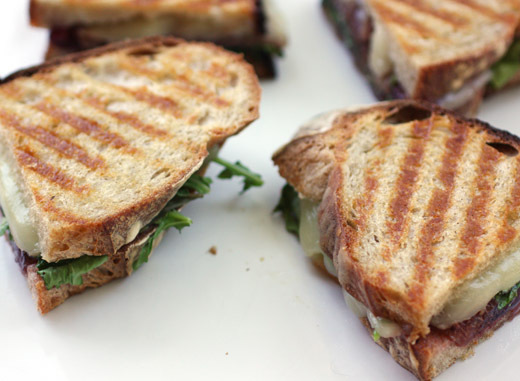 The panini came out of the press nicely smooshed and melty inside and toasted crisp on the surface. The only issue I had in making the fig relish was that mine didn't cook down as quickly as was mentioned in the recipe. The figs were stemmed and chopped and placed in a large pot with sugar, champagne vinegar, mustard seed, salt, and water. It was occasionally stirred as it simmered and thickened. The goal is for the mixture to achieve a jam-like consistency, and for mine, that took an hour rather than 20 minutes. You'll want to watch it as it cooks and remove it from the heat when you're happy with the texture. One other thing that I highly recommend is doubling or quadrupling the recipe. I only doubled it, and I'm already regretting not making more. The relish lasts for several months in the refrigerator, so you'll want enough that you can use it several times. The acidity of the vinegar balanced the sweet figs, and the mustard seed added a nice hint of sharpness. More panini just like these will be in my future as will enjoying the relish with some pieces of cheese and a glass or two of wine. I definitely should have made more than double the recipe. Virginia Willis, What Are You Reading? Virginia Willis’ book Bon Appetit, Y'all: Recipes and Stories from Three Generations of Southern Cooking appeared in 2008, and her new book Basic to Brilliant, Y'all: 150 Refined Southern Recipes and Ways to Dress Them Up for Company will be on shelves next month. A graduate of L'Academie de Cuisine and Ecole de Cuisine LaVarenne, Willis’ wide and varied food career started in Atlanta as an apprentice to Nathalie Dupree. She worked with Dupree on four PBS series and cookbooks, including the James Beard award-winning Comfortable Entertaining . She also spent several years as an editorial assistant with culinary authority Anne Willan on various projects including Cook It Right . 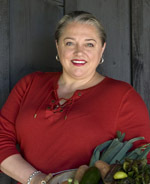 Willis honed her attention to detail as the Kitchen Director for Martha Stewart Living Television where she supervised the food segments for the Emmy-award winning television show. As Executive Producer for Epicurious on The Discovery Channel, she traveled the world taping fantastic stories about food. You can find her product line My Southern Pantry on her site and follow her blog for great recipes and stories. She currently has a proposed TV series Starting from Scratch as well. I managed to steal a moment from her busy schedule to ask what are you reading? 1491 - about life before Columbus --I started reading this because my friend, Chef Deb Snow owner of the Blue Heron, told me about it. A lot of this book is not about food so far, but so much of it in terms of culture, politics, and anthropology does involve food. The most intriguing parts of the book are about corn and other vegetables from South America vs those from Europe. I've learned from this book that old world vs new world doesn't really work anymore. That kind of language is indicative of prejudice. The "new world" had been a world for at least as long as the "old world." I've purchased, but not yet started Tomatoland (by Barry Estabrook). Good Fish (by Becky Selengut) Beautiful, beautiful book about sustainable seafood of the Pacific. Sustainable seafood is a passion and a cause for me. I was designated a seafood ambassador with Seafood Watch this year. I am thrilled to be a small part of a greater cause for improving the situation and educating readers about why sustainable seafood is so important. Ideas in Food (by Aki Kamozawa and H. Alexander Talbot) I mostly shy away from molecular gastronomy, but I am somewhat curious about it. And, for those folks completely dragging their heels, my question is would you prefer calves hooves instead of gelatin sheets? As cooks, as people, we should always strive to learn and grow. The Spirituality of Imperfection (by Ernest Kurtz and Katherine Ketcham) As I grow older I find it increasingly necessary to find more balance and focus. One practice I have returned to doing is saying a prayer of thanks before eating a meal. Even if someone has an issue with traditional religion, I think it is important to take a moment. To seriously, just take a moment in your day out of this busy, hectic world we occupy. In that moment I think it is important to give thanks for the food one is about to receive, the hands that put it in front of you, and the hands that grew or harvested the food. It takes a lot of work to get that food on your plate. As Always, Julia: The Letters of Julia Child and Avis DeVoto I was fortunate enough to spend time with Julia Child when I lived and worked in France. It's a real pleasure to see behind the scenes of the making of one of the greatest culinary educators and culinary icons of our time. Thank you for participating, Virginia. Check back to see who answers the question next time and what other books are recommended. Cold, refreshing beverages are an important part of my life right now and will be until the end of this hot, hot weather. So, I was thrilled to find some pages I cut from the April issue of Food and Wine that were full of cocktails and mocktails. This almond-fennel beverage was intended as a mocktail, but I couldn't resist adding some vodka. The flavors sounded intriguing, and since it's made with orgeat, I had to try it. Last year, I found myself in the middle of an orgeat search and learned that it's exactly the same as almond syrup. For the fennel flavor in this cocktail, a second syrup is made by steeping crushed fennel seeds in water and then dissolving sugar in it. 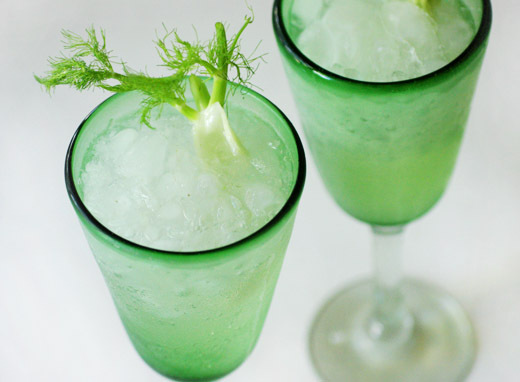 The bubbles from club soda and the green, frilly fennel frond garnish gave it a cool, crisp look making it an inviting way to combat the heat. You'll need to make the fennel syrup in advance since the seeds need to steep for about 20 minutes. A tablespoon of fennel seeds were crushed in a spice grinder and then added to a cup of water which was brought to a boil. It was removed from the heat, covered, and allowed to steep. Then, the seeds were strained as the water was poured through a sieve into a jar or measuring pitcher. One cup of sugar was added and stirred until it dissolved. 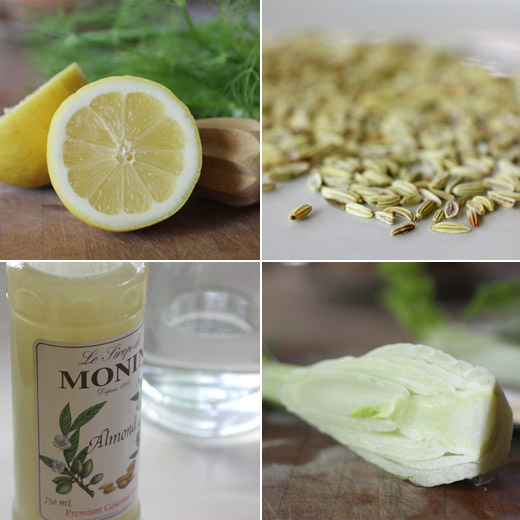 The fennel syrup can be stored in the refrigerator for a month. To make the cocktail, combine orgeat, or almond syrup, fennel syrup, fresh lemon juice, and vodka if you'd like. 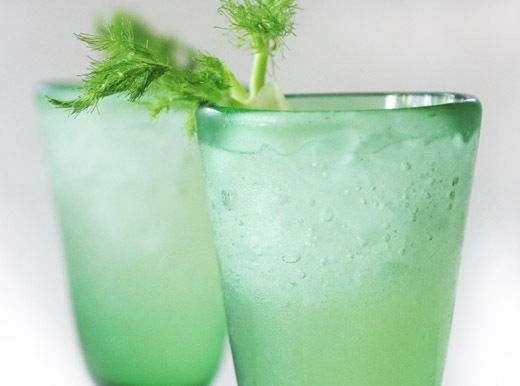 Add ice, stir in club soda, and garnish with a fennel frond. The mild anise of the fennel syrup blended nicely with the almond flavor. You should taste as you mix because I found I wanted a little more fennel syrup to be sure it didn't get lost behind the almond and lemon. It's true that I'm happy to see just about any beverage over ice these days, but the interesting flavors in this one made it particularly refreshing. When a bakery offers a cookbook, it may or may not reveal the secrets of what's found in its display cases. Years ago, I received a cookie cookbook from a well-known bakery, and none of the cookie recipes in the book were in fact the actual cookies sold in the shops. Those classified recipes were not revealed. Instead, the book was full of somewhat similar cookies in quantities appropriate for the home cook. The new book from San Francisco's Miette , however, is quite the opposite. I received a review copy, and in this book, 100 recipes are shared that describe how to create exactly what you'll find in the shops. For instance, all the cakes at Miette are made in a dainty six inch size, and all the cake recipes in the book are written for that size as well despite six inch pans not being very common for home bakers. It is explained that instead of baking two six inch layers, one nine inch cake can be made instead, but the techniques, ingredients, frostings, and embellishments included in the instructions will result in exact replicas of Miette creations. There are stunners like the fondant-covered, whipped cream-filled princess cake and the sleek and glossy bittersweet ganache cake that both have just enough decoration to make them special but the restraint that makes them chic. Beyond the layer cakes and cupcakes, the book also offers simpler afternoon cakes like carrot cake and honey tea cake. Then, there are tarts, cookies and pastries, and candies and creams. 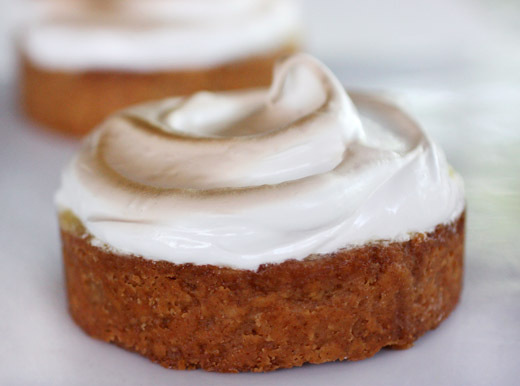 I was delighted by, and had to try, the lime meringue tartlettes made with a homemade graham cracker crust, filled with a double-sieved lime cream, and topped with a barely toasted boiled icing. All of the tarts in the book are made in a seven inch round tart pan, and each recipe includes instructions for individual tartlettes as well. 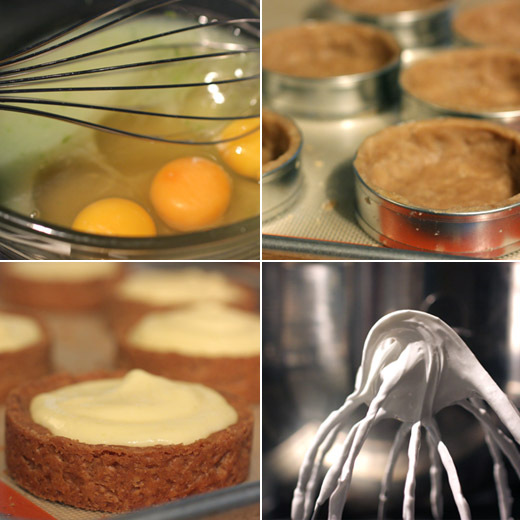 I chose to make tartlettes, and I used straight-sided, three and a half inch, round forms. The crust was a homemade graham cracker dough that was chilled before being rolled out between pieces of parchment paper. The paper made rolling the slightly sticky dough easier. Pieces of the dough were cut and fit into the tartlette forms. Each tartlette shell was topped with a square of parchment paper and filled with pie weights for blind baking. The instructions state to bake the tartlette shells for ten minutes, but I found they needed at least twice that long to become crisp. While the shells cooled, the lime filling was made, and this was possibly the best lime curd ever. In a double boiler, lime juice and zest, sugar, and eggs were cooked over simmering water while whisking occasionally until the mixture reached 172 degrees F. It may seem like it's not going to thicken, but have faith. Keep checking the temperature, and sure enough, at 172 F, it will be thick and lovely. This mixture was strained through a sieve for the first time at this point. Next, cubes of butter were whisked into the mixture, one at a time, whisking until each piece of butter was completely incorporated. It was strained through a sieve for a second time. I did pause and wonder if this was really necessary, but then when I tasted it, all was clear. This was the smoothest, most lush lime curd ever tasted. The curd was chilled, then spooned into the tartlette shells, and the boiled icing was made. After the meringue was swirled onto the tartlettes, I used the broiler to brown the meringue just slightly. I have to mention one issue with the boiled icing or Italian meringue. I've been involved in an on-going conversation about organic sugar and how it compares to conventional sugar in baking. In this book, it's mentioned that all the items at Miette are made with organic sugar and that the recipes have been calibrated to match results from more refined, conventional ingredients. So, I first made the meringue with organic sugar which is what I usually use in baking. The organic sugar meringue was grainy and not the smooth, perfectly glossy, white concoction as shown in the photos in the book. So, I made it again with conventional sugar and got that glossy, lovely result. The problem seems to be the grain size of organic sugar. I'm wondering if the bakery has access to a different type of organic sugar that has a finer grain than what is available at grocery stores. I'd like to experiment more and try grinding organic sugar in a food processor before using it for a meringue. Has anyone else had success with smooth, glossy meringues made from organic sugar? Despite the issue with the meringue, this was a star of a dessert. 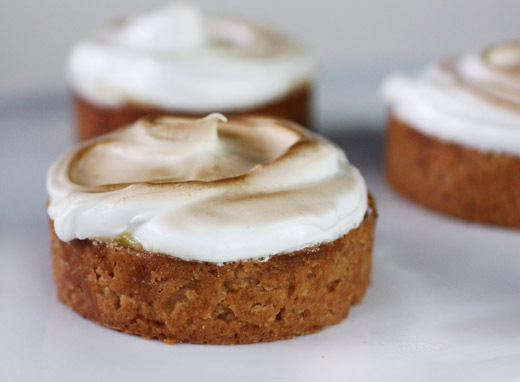 The crispy, graham crust and the perfection of the lime filling with the toasted meringue topping all just belonged together. The entire book is delightful to explore with the beautiful photos of most finished recipes and some instructive, prep photos as well, and the scalloped-cut edges of the pages add to the charm. The gingerbread afternoon cake, the lemon shortbread cookies, and the banana cream tart are all contenders for what to try next. What we have with these two dishes is a delicious mix of contrasts. 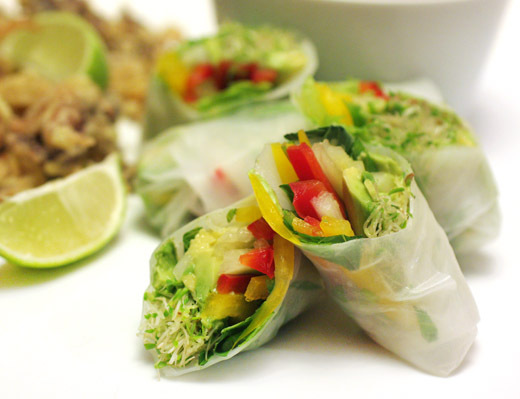 With the rolls, the pale, white, chewy rice paper wrappers are filled with bright, colorful, crunchy vegetables, and they're mild tasting until dipped in the chile lime sauce. Meanwhile, the fried squid is crispy on the outside and coated with a riot of flavor after being stir-fried with garlic, green onions, and chiles. 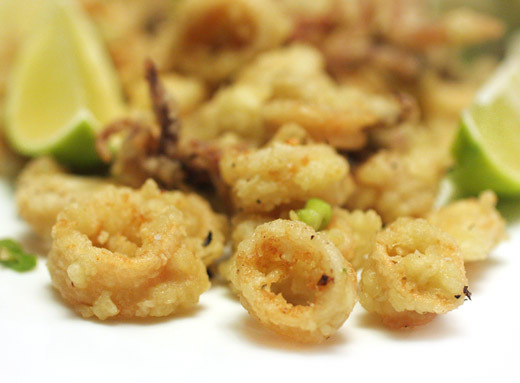 Under the crisp coating, the squid is pale and mild. These recipes came from an article about party food in last June's Food and Wine. I didn't actually make them for a party, but I can tell you they would have worked well for one. The summer rolls can sit in the refrigerator for a few hours after being assembled, and the squid can be kept warm in the oven after it's been fried. I did make one small change to the summer rolls. One of the filling items was supposed to have been rice vermicelli, but I was determined to use all raw ingredients and not have to cook anything for the rolls. So, I used shredded lettuce in place of the noodles. I made a slight change to the squid as well since I skipped the dusting with five spice powder that was suggested. Otherwise, I followed the instructions and was thrilled with the results. For me, making summer rolls is one of those fun kitchen tasks like pitting cherries and rolling fresh pasta dough. You soften a brittle rice paper wrapper in warm water, lay it flat, and pile on the fillings before folding in the sides and rolling it up snuggly. It seals itself into a nice, little package. I think the self-sealing is possibly what makes it so fun. The fillings here were thin strips of red and yellow bell pepper, shredded lettuce instead of rice vermicelli, strips of avocado which I tossed with lime juice to prevent it from turning brown, julienned cucumber, alfalfa sprouts, Thai basil leaves from my garden, and I might have added a few thin strips of serrano chile as well. The dipping sauce for the rolls was made with fish sauce, lime juice, sugar, water, and a chopped red chile. The fried squid was breaded simply by dipping the cut pieces into egg and then into cornstarch. It was fried in batches and left to drain. Once all the squid was fried, it was then quickly stir-fried in a little oil in which garlic, green onions, minced red onion, and a finely chopped jalapeno had been cooked. 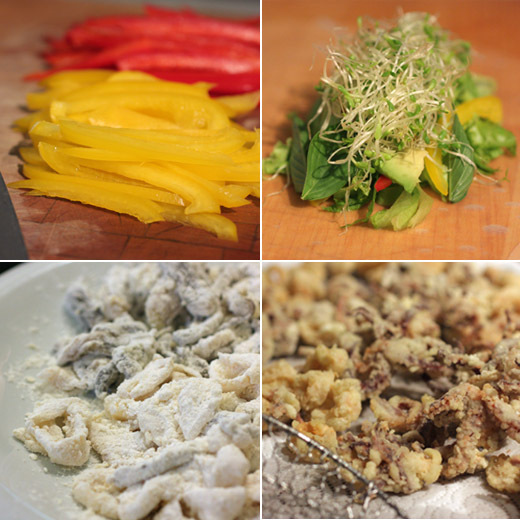 I actually really like squid, but I realize it might not be everyone's favorite ingredient. When it's fried though, it's hard not to like, and this version with the added flavor from the final stir fry was especially good. The salad in roll form was fresh and light while feeling a little more substantial than just a salad on a plate. These two dishes full of contrasts went together perfectly. There are a few standard types of cookbooks. There are the ones that offer recipes for soups, salads, mains, and desserts. Then, there are ones focused on particular topics like sweets or appetizers or grilling. I just read a review copy of Plum Gorgeous by Romney Steele, and this cookbook doesn't fit any of the standard moulds. Instead, this book is a stroll through an orchard from season to season with memories, quotes, and recipes for fruits at their peak of ripeness. The chapters move from citrus to berries followed by stone fruits and fall fruits. There are recipes for preserving fruits, turning them into lovely desserts, and using them in savory dishes too. So, among the citrus recipes, you'll find orange marmalade and preserved lemons and ideas for using them along with kumquats and toasted couscous with halloumi and a rangpur lime mascarpone tart. 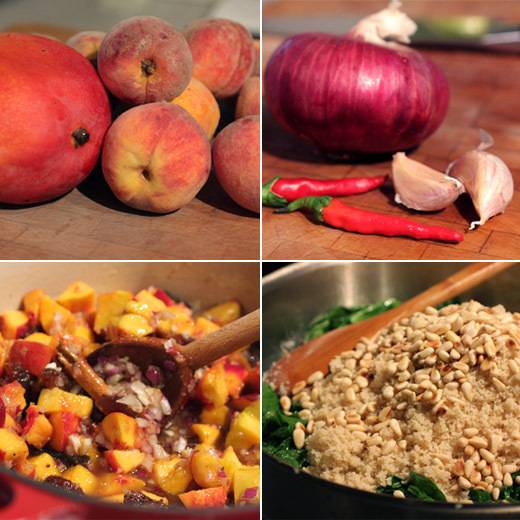 I was taken with the idea of making a sweet, savory chutney, and I had a mango from my CSA waiting to be used. There's an apricot mango chutney in the stone fruit chapter, but since it's peach season here, I went with what was available. Local peaches, onion, and chiles with my mango from south Texas and a few other spices became an aromatic, spicy condiment. There are suggestions for serving the chutney with cheese and bread or stirring it into a rice dish with chicken. I've used it two ways so far. First, I topped some little pieces of homemade sourdough with Pure Luck chevre and dollops of the chutney. Then, I stirred some into whole wheat couscous with toasted pine nuts, parsley, spinach, and pulled pieces of roasted chicken. Both were sweet, savory bliss. Making the chutney was actually easier than I expected even though it does simmer for about an hour and then sit overnight. A pound of peaches was pitted and chopped but not peeled, and the mango was peeled, pitted, and diced. The recipe also calls for dried apricots, and even though I was using fresh peaches instead of fresh apricots, I added a few chopped, dried apricots for the texture. Onion, garlic, a few chopped hot chiles, lime zest, grated ginger, a cinnamon stick, coriander seed, mustard seed, cloves, black pepper, raw sugar, and champagne vinegar were also included. Everything was combined in a stock pot and cooked until the liquid evaporated and the flavors came together. In the recipe you're instructed to leave the chutney covered in the stock pot overnight. I leave almost nothing out in my kitchen since I fear the house is too warm in the summer. So, I refrigerated the chutney overnight. The next day, it was cooked again to deepen the flavors, and I added a little salt and more black pepper. The finished chutney can be kept in the refrigerator for several months, but I don't think it will last that long. This book is both a guide to each season's fruits and a collection of fond memories centered on food. It's a great resource for using what's available now at the markets, or in your own orchard if you're lucky enough to have one, and for daydreaming about next season. 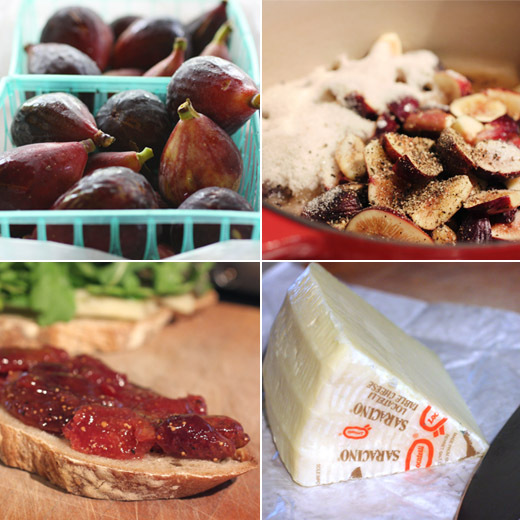 I've already tried the fig relish recipe as well, and I'll be mentioning that soon. Now, regarding that giveaway, Back to the Roots has offered to send a grow-it-at-home mushroom garden to one lucky commenter. I recently received a mushroom garden of my own, and it's an amazing way to easily grow food on your kitchen counter. The garden is contained in a small box with recycled coffee grounds for soil inside it. You just mist the open sides of the box each day, and oyster mushrooms begin to grow after about a week. 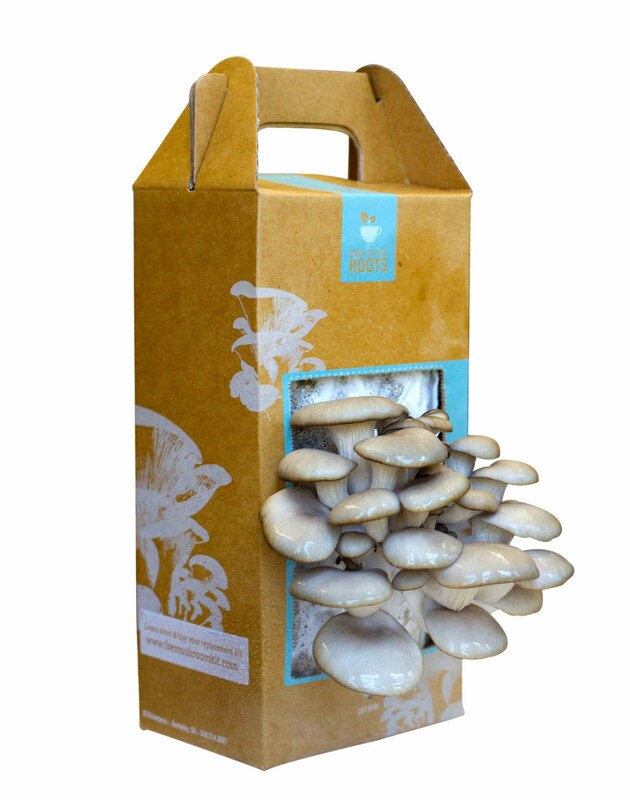 Read more about the mushroom gardens here, and you can receive a 10% discount on purchases with the code mushrooms4me10. All you have to do to win a garden is leave a comment on this post before Monday August 8, 2011 at noon CST. Include your email address with the comment so I can contact you. The winner must provide a US mailing address. Good luck! UPDATE: The winner of the mushroom garden is Lola Lobato.